Learn to Speed Read and improve your comprehension in Ten Minutes a Day! Which of these problems do you want to beat? The two part course below can solve all of these problems for you and you can get started in 2 minutes. How much more can you get done at college or work if you could read twice as fast? Three times faster? What if you could read Ten times faster and remember more!! The average person reads around 250 words per minute which is the rate you speak. Speed readers often double their reading speed by lesson 3. Once a person has learned how to speed read, they usually find their comprehension improves as well. This happens because your brain is no longer bored during reading and it is actually excited and active when taking in words. All of these are within your reach and all it takes is 10 minutes per day. There is a deep satisfaction in being able to speed read AND understand what you read. Speed Reading means your brain no longer becomes bored and tunes out what you are trying to read. You may have seen other systems making outrageous claims like reading 10,000 words per minute. Hog wash! That is not real speed reading, that is skimming and it does not work. Perhaps you have seen the systems that claim you can look at a page and...somehow...magically...know what it says through a photo reading method. Again, that will never work and that is not speed reading. Real speed reading is a method where you re-train your brain to break the old habits you were taught in third grade. Those reading methods were fine when you first learned to read and you needed to know the mechanics of reading. But now, those same methods only slow your reading down. You must learn a new way to visually take in words without that little voice in your head slowing you down. An automatic way of reading that becomes second nature and is much faster. Does the Speed Reader-X system include eye exercises? No way! Those are nothing more than gimmicks that waste your time. If you use a computer and read then you already have mastered all of the eye movement skills you need. I would not waste your time with filler games that do nothing but make you think you are doing something productive. Before releasing Speed Reader-X I conducted extensive research into what worked and what did not. I tested every system I could get my hands on and developed my own methods too. My research has shown that watching objects bouncing around a screen does nothing to train normally healthy eyes. I put together Speed Reader-X to be a sleek and to-the-point system that starts you learning real speed reading methods immediately without a lot of filler and fluff to make it seem like something it is not. It is a program that teaches you how to speed read and it does it as fast as possible, without gimmicks, without fancy animations that do nothing productive. This system jumps into real speed reading instantly, without wasting your time. passage each time you practice. drills. This addition would be greatly appreciated. Michael Says: Good news D. Smith: The new online version allows you to use your own reading material in the Practice area where you can create a custom lesson, plus we are adding new Comprehension, Vocabulary and Memory exercises. Are You Too Dumb To Learn? No! High intelligence is not needed for Speed Reading. Anyone, of any intelligence level can learn the speed reading methods. If you can watch a movie and understand what is going on, then you can speed read. Speed reading uses the visual centers of your brain instead of the vocal or sub-vocal centers which do not process information as fast as visual centers. You already have the ability, you only need to learn how to tap into it. Many people find that speed reading is the key they have been seeking. Slow readers are sometimes right brain dominant. That means they have trouble with reading skills because the left side of the brain is what most people use to read. By using the speed reading methods which utilize the right side of the brain, they find they can unleash abilities they did not realize they had. Reading becomes easier and even fun. Speed reading is for everyone, no matter what you may think your intelligence level is. I bought your program for my two children. They are doing fine in school but I wanted to give them any advantage I could. When I saw the difference in their reading abilities after just a week I was so impressed that I tried the program. Each night after they were in bed I was practicing and I cannot express what a difference it has made to me. I used to throw away magazines that I didn't have time to read, did I mention two kids who has time for anything, but now I can cover magazines and books at up to 600 words per minute...an amazing system.. I have recommended it to several friends. Michael Says: Thank you very much for the nice words Monica and I wish your children the best. You have already given them a great advantage because by starting early, they will gain the most benefits from speed reading as they enter their high school and college years. Keep practicing the methods you learned and your speed should continue to improve. Every minute you put off learning Speed Reading is another minute you will spend slowly struggling through reading materials, along with everyone else. Don't put yourself through that stress any longer. Why would you put off something that can improve your life in only 10 minutes a day. The solution is right here. 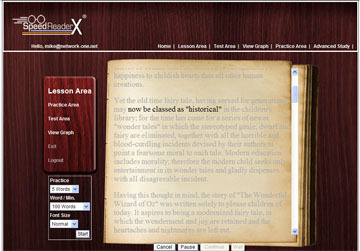 The Speed Reader-X training system has been one of the most popular speed reading systems ever produced and it is now available as a NEW online course with more features. Simply login to your account and start learning. It is just that easy and you can discover a new world of reading in the next 2 minutes. Works with Windows, Mac, Linux, and any other system that can run a modern Internet Browser. One of the greatest things the Speed Reader-X Online program can offer is the ability to learn at your own pace. Different people learn at different rates. The Speed Reader-X program is designed to accommodate everyone. It works for adults and children 8 and older, seniors, mom's, dad's, everyone. You can go through lessons as fast or as slow as you need to. You can repeat lessons anytime. You can even use the special Practice area to create your own lessons where you set the speed and even the material that you are comfortable reading. With this system, you cannot fail. The only way to fail, is to not try it. This is NOT a recurring subscription and your credit card will NOT be charged monthly. You will be able to access the online system for a full year. Still don't believe me? Then how about this, I can show you that speed reading is not as complicated as you might have been led to believe in this free mini-course. I want everyone to know how speed reading works so I am willing to give away the secret for free plus I will give you an eBook called Speed Memory just for allowing me the opportunity to show you how this system can improve your life. Simply enter your name and email address below and I will send the eBook and first lesson to you immediately along with the secret to speed reading mini-course explaining where speed reading came from and how it works. Note: I hate spam! I even created a free toolbar to protect you from spammers, that is how much I hate spam. I won't share, rent, or sell your email address or information with any unauthorized third party, ever. The entire concept of speed reading may still seem overwhelming. It is actually very simple. If you are unsure, then signup for my free mini-course above which explains how speed reading works. The best and shortest way I can sum it up is to say: Speed reading re-trains your brain to break bad habits learned in school and shows you new reading methods that remove the old roadblocks to your potential. The people who DO take this opportunity will end up with your job! My system can change the way you read. You may soon find speed reading easier than regular slow reading. Speed reading is not 'pushing harder'. Anyone can push harder and read faster but this only works for a short period of time. The techniques our system teaches you will change how you read and make reading magazines and books as easy as watching a movie. Hi, I'm using SpeedReader X 5.0, and I like it. ... Just at day 3, but I'm practicing at 5,000 wpm and reading at 1000 or so. Michael Says: Wow, I love being able to help people like this. I'm an IT professional working for the USGA and I was working on someone's PC when I noticed that they had this software called Speed Reader X. I asked the user about the program and if it actually works. The user works in our Rules and Regulations department so they have to go through a lot of documentation and she told me that she goes through the documentation very quickly because of the fact that she knows how to read quickly AND RETAIN the information she just read. She recommended the product highly so I am purchasing it because I do plan on going back to school. Knowing how to speed read will give me that edge. I can't wait to try it. This is the graph which shows your results. After each speed test; it is updated with your latest score every time you finish a lesson. Try It RISK FREE. These are only some of the sections available and you can access any part of the online course by logging into your account anytime of the day or night. Are These Real Online Classes? Yes! These are real online classes, not just ebooks or static webpages. Each lesson starts with an audio presentation that explains what you will discover about speed reading and how you can gain the most from the lesson. The audio guides you easily through the lessons so you will know exactly what you are doing. You can also read along with the lesson introduction. This is a much deeper experience than you could ever obtain from a book or a simple software trainer. After the audio introduction, you can practice the specific speed reading technique you learned using the interactive visual lessons. Each lesson is custom designed to improve your abilities over the previous lesson. The next page shows your progress in a graph so you can see how much your reading has improved. The lessons are interactive and you can start/stop them anytime. You can repeat lessons and take speed tests anytime you want as well. If you want more control or need to move more slowly, you can use the Practice area where you can set your own speed and even select custom material to read. What can this mean for your future, or your child's future? If you start speed reading now, how much will it help you in 6 months, or 1 year? What about your children. What kind of a difference will it make in their entire education. How much will being able to read faster than their classmates put them ahead of everyone else. What kind of an advantage will it give them in school and in life. What kind of an advantage would it have given you in school if you could have read ahead in your textbooks instead of trying to keep up. What if you could have read through assignments in seconds instead of re-reading them two or three times in half an hour. If your reading skills had resulted in higher grades then would you still be working in the job you have now? Would you still be paid what you are paid now? It is not too late for you or your children. These advantages can put your life on a new track. How much is it worth to even possibly change your children's grades from C's to B's or from B's to A's. What would a gift like speed reading be worth to your children or yourself if you could pick up a book and read it anytime without it feeling like a chore or burden. What if your children were excited when they were given a reading assignment instead of whining about having to read even a few pages. Would your children someday look back and recall the gift you gave them which they use every day when they read? If you are one of our valued Senior Citizens, then you know how important it is to keep your mind active. Speed reading is the best way to keep your mind active because it re-trains your brain to become more active when reading so that you can read more, faster, and with less effort. What would speed reading be worth to you if you could learn more about your job, or even learn about a new field you are interested in which could lead to a higher paying job. Do you want to move from a $30,000 per year job to a $50,000? or $100,000? Top executives do a lot of reading and many have turned to speed reading to help them stay on top of their reading and on top of their industry. Information jobs are the highest paying jobs out there and they require top reading and understanding skills. Wouldn't you like for your child to graduate college with higher grades so they could start out at the top in a position the company was anxious to fill with a capable individual instead of at the bottom in some small company that hired them just to fill a seat and answer phones? Reading ability can cause major changes in anyone's life. It can mean higher grades, higher paying jobs, the ability to move into a new field or study an area that you have always been interested in but never had the time to pursue. What is it worth to you to make more money in your job, to change to a career you enjoy, or to give your children an advantage they will treasure for the rest of their life? Hi. I'm on [Lesson] 3 and have already gone from 240 wpm to over 500 wpm. I feel so strongly that everyone should learn speed reading, I am offering an unprecedented 30 day satisfaction guarantee. If you should decide that the program is not for you, simply contact me through the support link in your console to request a refund. There is nothing to return, no RMA numbers, and no hassles to deal with. I am confident that once you use the system you will see the improvement in your life. Speed reading has been around in one form or another for a long time but very few people take advantage of it or even know about it. This new system makes it easier than ever to learn. This is your chance to join the elite group of people in the world who can speed read. Don't miss this opportunity! If you order now I will also include a special bonus described below. 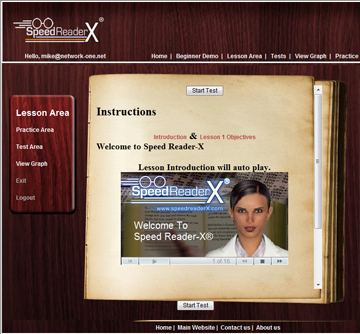 The Speed Reader-X Experience does not stop with Speed Reading. 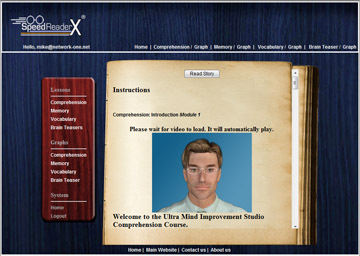 We also offer the Ultra Mind Improvement Studio which includes full classes on improving your Comprehension and Memory. This is the online complement to the Speed Reader-X course and I highly recommend taking both if you are serious about improving your reading and memory skills. When I began developing the online version of Speed Reader-X, I really became excited at the possibility of being able to easily update and add content to the system. The old system of sending out software on CD made updates difficult. With the new online system, we can add more content, respond to requests, and continue to add features so everyone benefits immediately. 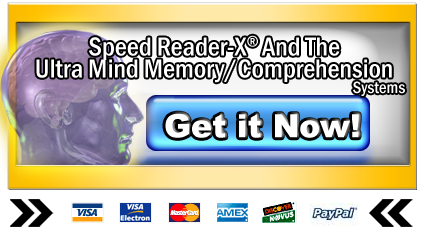 I received many requests from Speed Reader-X CD users for additional Comprehension training and Memory improvement. I have spent the past two years researching and developing the new Ultra Mind Improvement Studio which has exactly what you need to improve your reading and memory. This system is for both Speed Readers and regular readers too. Do you understand everything you read? Do you find yourself reading to the end of a paragraph, then you look up and have no idea what you just read? The problem is your comprehension. According to a report in the Journal of American Medicine, Emory University/UCLA study, reported in JAMA, 12-95, 41.6% of American patients could not comprehend directions for taking medication on an empty stomach. Another 26% were unable to understand information explaining when their next appointment was scheduled, and 50.5% could not understand a standard medical consent form. "Reading skills are critical to a student's success in college courses across the board, but particularly in the areas of social sciences and humanities. First-year college students who don't have adequate reading comprehension skills are likely to struggle in courses such as history, sociology, literature, business and others that require extensive reading. About half of ACT-tested 2005 high school graduates lack at least some of these reading comprehension skills, based on ACT's new College Readiness Benchmark in reading. ACT College Readiness Benchmarks are scores that indicate a student has a high probability of success (with "success" defined by ACT as earning a "C" grade or higher) in specific entry-level college courses." Many people do not even realize they have poor comprehension. They assume everyone reads the same as they do, or they read in a mechanical way that prevents them from retaining any information. They can read, but they do not remember anything and they do not know what the real problem is. If you read and do not understand, you can discover new methods to comprehend what you read. Many schools once had a belief that you Got-It or you didn't when it came to comprehension. We now know that to be false. Comprehension can be taught. Unfortunately many people were never given the tools they needed to read properly. They do not know the fun and excitement of reading a novel because they were never shown how they could understand what they are reading. This is the audio introduction page for the Comprehension lessons. This is a separate training system from the Speed Reader-X system and is a complete course in itself. The video instructor explains every lesson and gives you many tips and tricks. Enroll Now and try it, you have nothing to lose. You may have been a victim of a poor school system. In the past, many school systems and teachers believed that when it came to comprehension, you got-it or you didn't. Today we know this is simply false. Comprehension can be taught and improved even for adults. The last thing a poor reader needs is a book explaining how to read. My program contains no filler, no long boring stories, no obscure teaching theory. It is a carefully chosen, simple strategy approach that gives you the step by step tips you need to improve your reading. The classes are divided into easy to digest chunks with clear and simple objectives that yield immediate results. This course benefits both good readers and poor readers. Good readers are only good at reading some material and when they run into more difficult material they freeze up. They do not know what to do. They have hit a brick wall because they are accustomed to reading and understanding certain material well, but when they encounter material they cannot as easily comprehend, it stops them cold. Then they have no idea how to fix the situation and the result is frustration and they eventually quit trying to read anything outside their zone of comfort. Even good readers need to know the reading strategies that improve comprehension so they can apply them when they encounter more difficult material. This course can be used by adults, children, and parents who want to help their children improve comprehension. Many adults do not discover these methods until college and some not until retirement. A full life without being able to enjoy reading only because they did not know the simple techniques that make reading fun. Today schools dump more and more work on students, while at the same time complaining that the student's reading ability is below normal. They then do nothing to fix the problem except dump more work on them. We need to fix the reading comprehension problem, then students can more easily deal with the work they are required to do. This comprehension course is designed for both speed readers and non-speed readers and will benefit you. This comprehension system also has special areas for parents who want to help their young children improve reading skills. You can teach children good reading habits even before they start reading. This will give them a great advantage when they begin learning the mechanics of reading. Each lesson includes an audio instructor explaining the methods you can use to improve your comprehension. Optional comprehension tests are also available so you can test your new skills and see a graph of your progress. It does not stop there. I am also offering another new module, Vocabulary training. A strong vocabulary is important for reading, both regular and speed reading. If you do not know what some common and semi-common words mean, you can never understand sentences that contain them. This system will introduce you to new words, test your vocabulary skills, and expand your understanding of what you read. These are not randomly selected words or hard words no one has ever heard of. These are words that are common but that most people do not understand well enough to use in conversation or assume a meaning from the context which is not always accurate. This i s not the simple memory games you see in books or the silly computer games that make you think you are learning when you are really just clicking images. No, this is a serious memory training course. Have you been introduced to someone and then you forget their name by end of the conversation. Do you forget their name by the time they shake your hand? Some simple memory tricks can teach you how to lock names into your memory forever. There are two parts to your memory. Short Term and Long Term. Your short term memory takes in everything and if it is judged as unimportant, it is thrown out and forgotten. Only important events are passed into the long term memory. You can train your short term memory to selectively move information to your long term memory so you can recall it later. This is why people forget names, numbers, and important events. Their short term memory never passes the information to long term memory where it can be recalled later. You can learn simple methods that will trick your short term memory into moving important information to your long term memory so you can easily recall it when you need it. If you want to improve your memory this is the easiest and fastest method. Discover methods of memory improvement that you can apply every day. Each of the 10 lessons starts with the instructor discussing memory improvement methods. You then take a quick memory exercise to practice what you have learned. Each exercise is uniquely designed to improve your image memory, your ability to remember numbers, remember names, remember dates, remember lists of words, remember what you see in movies and paintings and more. 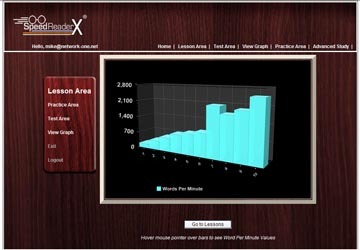 This is a full memory course, with instructor, tests, and graphed results to show your progress. Brain teasers are not only fun but they can help you improve comprehension and memory. That is why they are included in this course. The brain teasers selected will show you how to pay closer attention to what you read and to extract details. Many people experience confusion and problems with comprehension because they let their mind fill in blanks that they should not. They make assumptions about what they are reading that later conflict with the story and this causes confusion. These brain teasers will quickly show you how to filter what you read to only the facts that are presented while at the same time letting your mind explore options that are not in the written words. Don't worry, it is a lot more fun than I make it sound. Because of the high independent value of the new Comprehension, Vocabulary, Brain Teaser and Memory modules, this combo-offer is only being made for a limited time. Select the special combo offer for both the Speed Reader-X course and the Ultra Mind Improvement Studio combo package to receive your discount. You can also access 17,000 eBooks of classic literature in many languages. After you sign-up, these are available online from a link in your control panel. The DVD of these eBooks sells elsewhere for $39.95 but you can access the online version for free. Other comprehension and Speed Reading courses may sell for $299 or more but none have my research behind their design and none have a complete online system like the "Speed Reader-X Plus Ultra Mind Improvement Studio Combo-Package "
I have a very simple promise to make to you. If "Speed Reader-X Online " is not everything I've said it is, and if it doesn't for any reason transform your reading ability into a new and powerful experience filled with opportunities, you can ask for a full and complete refund and receive it within 24 hours. Since Speed Reader-X came out, we have had so few refund requests for the many thousands of units sold, I can confidently make this offer because I know my system can help you. You've got 30 full days to think about it, try it, test it, poke it and prod it from the date your subscription begins. That should give you plenty of time to experience all ten speed reading lessons, and the invaluable comprehension and memory training as well. I hope you think so, because I've been told it's more than fair. If you honestly believe you’re not learning, you get your money back. Simple as that. Sign up now to discover the speed reading skills that can improve your life. Remember, for a limited time you can get access to the new Comprehension, Vocabulary, Memory module for a discounted introductory price. This is NOT a recurring subscription and your credit card will NOT be charged monthly. There is nothing to cancel later. You will be able to access the online system for a full year. P.S. One other thing I feel compelled to tell you about. Reading is the single most important skill anyone can have in today's information based society. If you cannot read both fast and with understanding, you or your children will be left behind very quickly. I believe it is important to give everyone the tools they need to be successful and speed reading is one of the best tools I have found. If you are not ready to take advantage of this amazing offer, then request your free memory improvement eBook and sign-up for the FREE Speed Reading mini-course so you can at least get started doing something to improve your life. You must enroll online now. I can only make this special price offer available for online purchases. Phone and mail orders are only accepted for the physically shipped CD version. Try out the online speed reading course for yourself and if you do not like it, you can cancel and receive a full refund in 30 days. Go HERE to enroll in the course now.